If you’re like me you’ll be eager to get started on a new party piece for those end of year events! If you would like to support me in making more music do have a look. When I make an arrangement you will be the first to receive it, and are encouraged to give suggestions about what pieces you would like arranged. I find this platform a good way for me to interact with fellow cellists who enjoy my music. Video of Marriage d’Amour, as usual made in front of my famous Narnia cupboard… from inside it, inspiration flows. This entry was posted in Products, sheet music, Video and tagged cello, Ilse de Ziah, Mariage d'amour, play cello music, solo cello, solo cello music on September 18, 2017 by ilse. I have made a profile on the Patreon site and I am hoping to get people to support me. I have nearly 5000 YouTube subscribers, and to these people, especially you who comment, thank you for constantly inspiring me to make more arrangements. As long as I know someone is loving them and getting to play them on their cellos, I am happy. All I need is a small amount of people to pay $1 a solo cello video release and I can continue composing and arranging and making it all available. I love what I do. If you love what I do, it’s only a tiny amount, but it adds up to support me as a self employed cellist. Anyway, have a listen to the newest arrangement and watch the video! This entry was posted in sheet music, Video and tagged irish cello, patreon on February 9, 2017 by ilse. Trad on Cello! 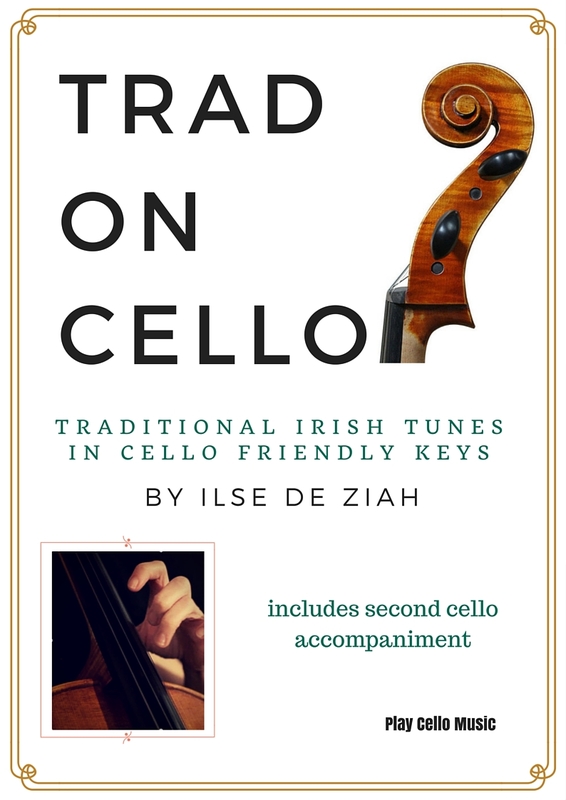 New cello book available now! I am pleased to announce the release of my new cello book, Trad on Cello. There are twenty Irish traditional tunes including polkas, slides, jigs, reels, hornpipes and slip jigs, with a guide on how to play them. The introduction and chapter information is detailed and interesting for anyone who wants to have a little more guidance and get a brief background info on the tunes. For teachers looking for something a little different to inspire students post exams, these are a perfect antidote to the earnestness of exam preparations. I made a video of one of the reels to give an idea of what is in store for you and I hope to see other videos from cellists playing these tunes too! This entry was posted in Books, Products, sheet music, Video and tagged cello, cello sheet music, irish cello, solo cello, trad on cello! on May 30, 2016 by ilse. Living the Tradition is now available through MusicFilmWeb wo have added the film to their catalogue. Here’s a quote on the MFW site. Thanks to Andy Markovitz for his support and writing the kind words! Do support us by renting or buying and enjoy watching this beautiful film!! This entry was posted in DVD, Film, Video and tagged irish cello, Living the tradition, music documentary, musicfilmweb on October 22, 2014 by ilse. Very excited, the trailer for Living the Tradition has now been made and the film will be released January 15, 2014. Have a look at our Living the Tradition website, and enjoy the trailer! We are releasing a 96 minute documentary along with ten music videos. There will be a DVD and an online version available. In the last week of this year, we will be pre-selling the DVD version for a reduced price, so stay tuned! This entry was posted in Film, Video and tagged film, irish airs, irish cello, Living the tradition, solo cello on December 17, 2013 by ilse. We also performed the first pilot version of the Living the tradition live-documentary on Thursday, which is Arthurs day, a Guinness celebration in Ireland. Guinness showcased 20 acts around Ireland and our projects was chosen to be one of them. We plan to tour it next year. We are very excited about the progress of the film! 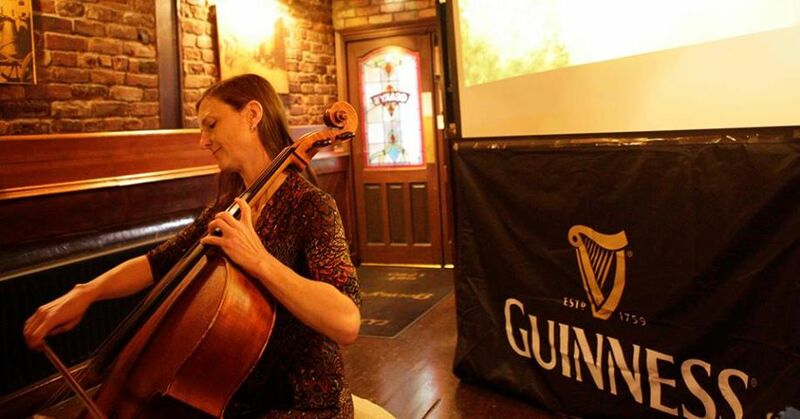 This entry was posted in Events, Video and tagged Arthurs Day, cello, Guinness sponsorship, Living the tradition on September 28, 2013 by ilse. This entry was posted in Video and tagged film, irish cello on July 9, 2013 by ilse. I composed and played the music for a scary slasher short film for egomotion pictures. It's on the short list for the Blood Games Short Film Competition. Watch and you'll never be able to listen to twinkle twinkle in the same way! Go and vote for it!! This entry was posted in Video and tagged bloodgames, cello, short film, slasher film, twinkle toes on April 18, 2013 by ilse. Even if charts are not so important these days (especially as to reach the top you usually have to pay) I was happy to see I have reached No. 2 in the Folk charts for Cork on reverbnation! If everyone goes and has a quick listen there, I may even reach number 1! I am working on new arrangements for trad Irish tunes and will put them up for sale on playcellomusic.com soon. I'm working towards putting out my next Celtic Cello CD. After some requests I made a tutorial of College Groves, so incase anyone wants some extra help have a look… there were sync problems as it was a trial of another system which would be easier, but no it doesn't work. I will be doing a series of tutorials, in sync, and a little clearer… so feel free to give me any feedback on the pieces you'd like for this or comments etc. I've put the original youtube clip of College Groves here too. This entry was posted in Events, Video, workshops and tagged charts, college groves, reverbnation, tutorial on March 17, 2013 by ilse. Nigel Kennedy plays trad. duo with Ilse! A friend sent me a video from her phone today. She was at the City of Cork Symphony orchestra concert in the Limerick University Concert Hall where we played with Nigel Kennedy. He started playing a trad tune and I couldn't resist joining in. We played a trad set again the next night in the City Hall in Cork, to more rapturous applause and afterwards had a great jam along with Cora Venus Lunny, Donovan and other CCSO improvisers! This entry was posted in Concerts, Video and tagged irish cello, Nigel Kennedy, trad duo, violin on February 4, 2013 by ilse.